If your cat recently switched to indoor living from an outdoorsy lifestyle, you might be wondering if their dietary needs have also changed. 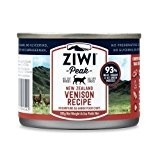 Cat food brands offer an enticing variety of cat food formulas designed for your cat’s unique activity levels, age, breed, and health conditions. 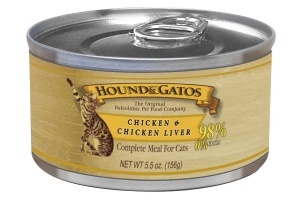 Indoor cat food in a special variety that promises to nutritionally target your cat’s needs. But do cats who live inside really need different food than those who live outdoors? Think about humans who spend most of their time outdoors versus those who are usually inside. How do their dietary needs differ? Individuals who spend a lot of time outdoors typically get more exercise than the average desk jockey. 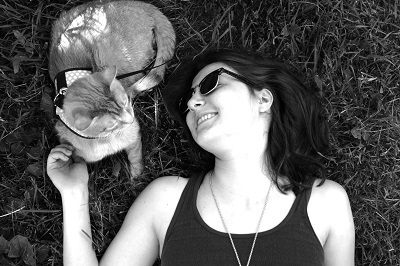 Like human outdoor enthusiasts, outdoor cats tend to spend more time working out – climbing trees, hunting, and exploring. Decreased activity means decreased calorie needs. Your indoor cat may be inactive or tirelessly energetic, but in general, cats who live indoors don’t get as much exercise as those who live outside. This, in combination with an inappropriate diet, puts them at risk of becoming overweight or obese. Indoor cats may suffer more from hairballs. Because indoor cats have more free time to spend grooming themselves, they tend to suffer more from hairballs compared to cats who live outside. Hairball issues are directly linked to poor digestive health – something that can be improved through a biologically-appropriate diet. 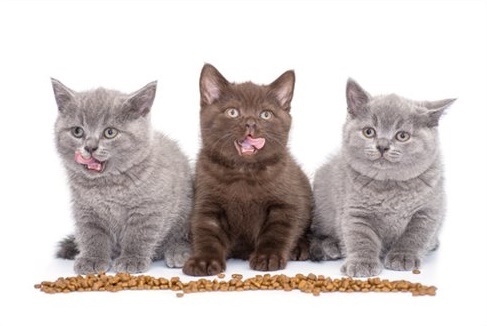 Some indoor cat foods incorporate additional fiber to help hairballs pass through smoothly. Your indoor cat may not catch mice, but it is a dedicated carnivore nevertheless. According to much evidence, cats’ dietary needs haven’t changed much since they first wandered into human settlements and started killing and eating rodents around 9,500 years ago. Their propensity for eliminating grain-eating mice earned cats their place in human society back then – why are so many people now feeding them mouse food? 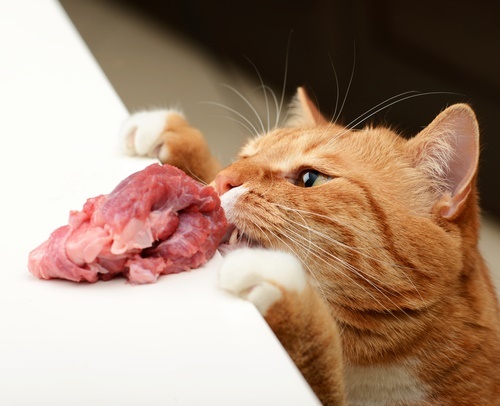 The ideal diet for your cat is a balanced raw diet made from raw muscle meat, organs, and bones. If you don’t want to feed your cat this type of diet, there are plenty of good alternatives out there, and fortunately, identifying them is simple. Look for ingredient lists that start with meat. Any food that uses corn or rice as the first ingredient is better off in the trash than your cat’s food bowl. The inclusion of byproducts puts you at a risk of feeding your cat low-value meat from low quality animal parts, unidentified animals that could trigger allergic reactions, and low-quality cuts of meat that aren’t easily digestible or highly nutritious. Always look for high quality meat ingredients like “turkey”, “lamb”, “beef”, and “chicken liver”. Avoid labels including vague ingredients like “poultry”, “meat byproducts”, and “rendered meals”. Ingredients like corn, soy, and wheat are fillers that don’t offer any nutritional value for your cat. They’re cheap binders and should always be avoided. Look for food that won’t contribute to weight gain. 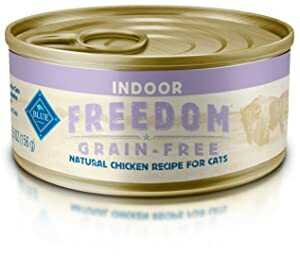 This is the number one thing that cat food manufacturers are targeting when they make foods for indoor cats: accommodating the reduced calorie needs of a less active cat. What they so often get wrong is cutting higher calorie protein and replacing it with lower calorie containing fillers, so as to appear containing a lower total amount of calories. Good foods for indoor cats keep them satisfied for extended periods of time. While they often have lower calorie counts, carb – rich foods won’t keep your cat full and can lead to blood sugar spikes and fat accumulation. 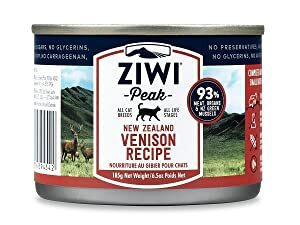 Instead of picking the first low-calorie food designed for indoor cats, the best approach is to seek out a high quality protein (even if it seems to be higher in calorie content compared to other fillers), nutritionally-dense food and serve it in controlled portions. Is dry or wet food better? Whether your cat lives indoors, outdoors, or somewhere in between, the answer is always the same: choose wet food. Cats have naturally low thirst drives and don’t typically drink enough water to compensate for the lack of moisture in dry food. Those who consume dry diets often become chronically dehydrated, leading to urinary tract disease and renal failure. Only wet or raw food, with its approximate 70% water content, can deliver the moisture that your cat needs to stay healthy. High-moisture foods are also more satiating and help your indoor cat to stay slim and feel less hungry. 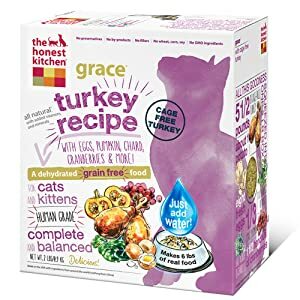 Now that we’ve established a criteria for what makes a great indoor cat food, here’s a quick list of some of the best foods for your indoor kitty. While the food does include some carb content coming from sweet potatoes, that don’t fit into a truly carnivorous diet, the ingredient does serve a purpose – it’s thought that dietary fiber can aid digestion and reduce hairballs. 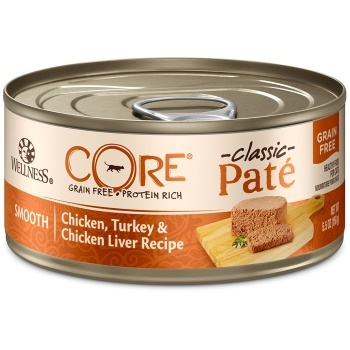 Listed as one of the best grain free cat foods, this chicken pate was designed specifically with indoor kitties in mind.